Size: 4.7" x 4.1" x 1.0"
Is it a small desktop calculator or a large handheld? From the designation "TI-1795" it is clearly categorized as a desktop product, from the size it could be a handheld like the TI-508. Dismantling this TI-1795 manufactured in September 1984 by Compal Electronics in Taiwan reveals a rather simple construction based on probably a Sharp single-chip calculator circuit. This TI-1795 introduced in 1984 started a line of everlasting calculators, compare it with the TI-1795+ and the TI-1795SV. In 1988 the design of the TI-1795 was slightly changed before production was shifted to Thailand in 1991. The TI-1775 put similar specifications in a foldable housing while the TI-1796 added a battery backup and sports a 10 digits display. 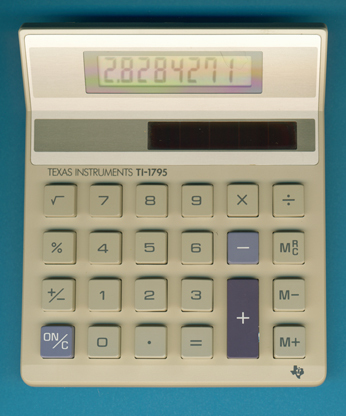 The TI-1795 is featured in the Texas Instruments Incorporated bulletin CL-854 dated 1985.